I love finding new and original ways to give gifts. My sister loves to bake and is always asking for new baking items so when I saw this gift I thought it would be perfect for her. 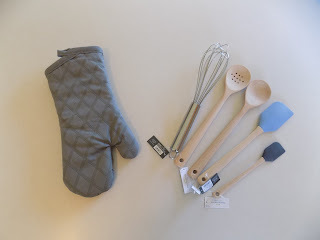 She was also in the middle of remodeling her kitchen so I got her a few things to match her new color scheme. 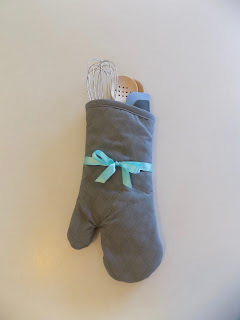 I simply added all of the items to the oven mitt and tied a bow around it. You can add as many items as you would like. What are your kitchen colors?